If there's a singular challenge to summer dressing that rises above them all, it's how to wear stylish looks that are casual enough to be seasonally on-trend—without looking sloppy. It can be especially tricky nowadays, when the undone look is very in. 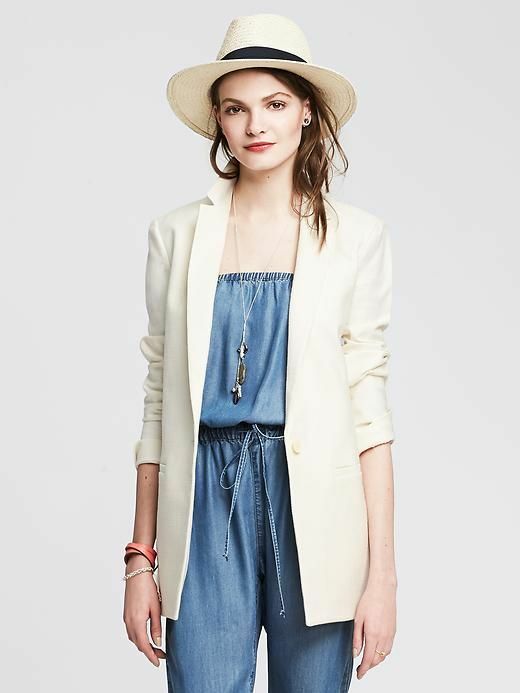 Our resident style expert, Banana Republic creative director Marissa Webb, tends to excel at achieving a perfectly polished casual summer look—so, naturally, we consulted her. "You have to be able to adjust according to your lifestyle," Webb told us. "I'm in a business where I'm running around being very physical and the next minute in a serious meeting where I need to look polished. It gets a little tricky at times. Most importantly, keep the words contrast, contradiction, and opposites in mind when pulling together your casual yet polished look." Keep scrolling for Marissa Webb's tricks for making your favourite casual looks super-polished! Toss a well-tailored blazer over your casual jeans and T-shirt to add polish to a casual outfit. Create a simple formula that works for you. For example, if you know you want to wear comfortable denim, try to find something a bit dressier on the top. If you know you want to wear your favourite "get it done" T-shirt, pick something more tailored to wear over it. I like the contrast of heels with casual bottoms. I'll often style my easy cargo pants, denim, or soft lounge pants with a heel. Mix it up with something dressy and something casual, like a feminine lace blouse with cargo pants or denim. I find the contrast more interesting, and it's also a great way to not be over- or under-dressed. Have fun with your accessories and don't underestimate them. Stack up your necklaces or bracelets with your favourite easy T-shirt for the right mix of polished casual. What are your tricks for staying polished during the summer? Tell us below!